Boiled peanuts are a Southern tradition and these are some of the best we've tasted. When you heat these up, you will be able to close your eyes and almost smell the salt air and hear the pounding surf on North Carolina's Outer Banks. We've tasted a lot of boiled peanuts, but these are the best we've ever had! I discovered boiled peanuts after visiting a Virginia farm. 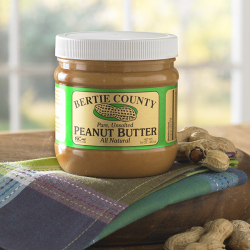 Some time later I searched for a product and found it with Bertie County. Each can, each peanut is just perfect. Every bite is consistently amazing. Every package arrives promptly and well packed. This operation is professional and responsive. Never, ever anything but MOST happily satisfied! I purchased the boiled peanuts online for my husband. He really enjoyed them. This is the second time we have purchased this product. 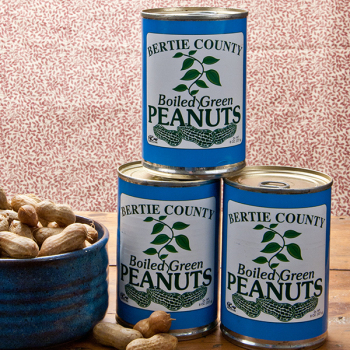 I found the shopping online at Bertie County Peanuts to be very user friendly. My order arrived exactly when expected. Great shopping experience. Very Disappointed very slimy and mushy. Or very hard not boiled enough. Waste of money on 12 cans. Much better than other brands out there--not too salty and large size peanuts for the most part. Not the best boiled peanuts I've ever eaten but pretty good. The brine is a little too sweet and watery.. But overall a peanut worth trying if you like boiled peanuts and I love the things. Delicious as I remember. Can't get them up here. I'm going to share them with family who have never tasted them. Great. Thanks for making them available up here. They were delicious and I plan to order more. Like all boiled peanuts, they look terrible. But they tasted good and I plan to order more.